In 48 hours, we’ll be on the trail. I don’t know if it’s because I’m sleep deprived or I’ve just been too busy to realize that the day we’ve been anxiously awaiting for a year, is almost upon us. The past few days at home have been a whirlwind of non-stop activity. My room has been a mess and I finally go that all organized last night. Even if no one is going to spend time in there, I didn’t want to come home to a huge pile of stuff sprawled out all over the place. Our talks at the high school with two English classes went really well and we’re excited that they’ll be following us on our journey through my blog. A big thanks to Clout for having us. It was nice to see some of my old teachers before I left and a few of the soccer girls as well. Everyone had lots of questions and we love it! It’s great that people are interested in this whole thing because I know I would be too. One of the most popular comments we’ve received is, “this will be a real test of your relationship!” And those people are so right. I’m not even going to begin to get into the nitty gritty details of all of the things we’ve had to do since Saturday, but the majority of it involved finalizing our gear and getting our mail drop to Neels Gap and bounce box ready. We’re just about to mail out our drop box at the post office and we’ll be just about ready to head to Portland and then on to Georgia tomorrow! It’s looking like our first night on the trail will be in the 30s, but from there it’s looking like temperatures in the 60s during the day and 40s or low 50s at night. We would love that, but if the weather changes, we’ll adjust and we are prepared for that. 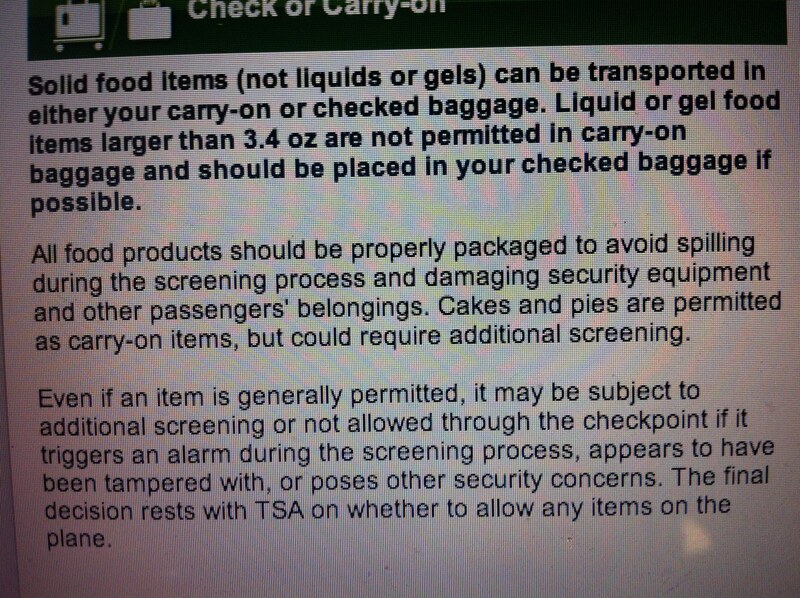 We were doing a little TSA research on carry-on items. Good thing we aren’t bringing any cakes or pies. We did our final gear weigh-ins last night and we’re right about where we want to be. My base weight without food and water is 20 lbs. and Miles’ is 21 lbs. As we hike, I’m sure we will shed some weight, especially when the weather warms up. But all in all, we’re pretty relieved that we didn’t go way over our weight estimates and that we’re just about on target. I’m hoping to update you all a couple of times before we leave on Thursday morning to begin our hike, but I just wanted to give a huge thank you to everyone who has supported us in all ways during the past year in preparation for our hike. From supportive words, to reassurance of our decision, and the many good lucks, we are very thankful. I admit, what we’re doing is a little crazy, but it’s nice to know we have so many people behind us and rooting for us along the way. The most thoughtful gift I received for our trip was from one of my best friends, Hayley. It’s a small orange and red stone, Fire Agate. The description that came with the stone reads, “Fire Agate has a deep calming energy that brings security and safety. It is a protection stone with strong grounding powers.” I love it and it’s perfect for our trip and I will keep it in my pack throughout our entire hike. Love you Hayley! Now I must continue final, final preparations. I’ve gotten in a few amazing meals made by both of my parents, hung out with friends, and packed up all of my belongings. It’s time to say adios to all of the daily comforts of civilization and say hello to a new life on the Appalachian Trail. 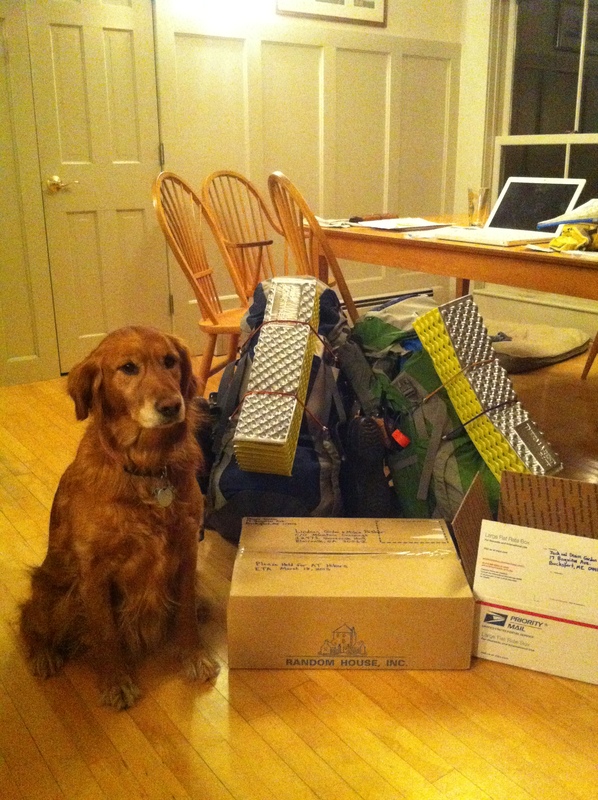 Stella with all of our gear. I’ll be following! But don’t worry too much about posting. Enjoy the trail! Stella seems to be guarding the gear — she’s a hoot! Safe hiking! I think she wanted to come along with me!